Books are such a wonderful tool for teaching children and every now and then, you can find a book that not only teaches but thoroughly entertains. 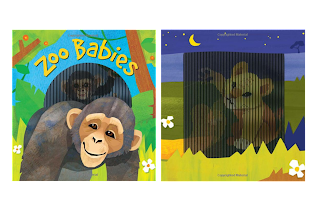 aMomEntrepreneur gave me the opportunity to receive and review a complimentary copy of Zoo Babies by Accord Publishing. What makes this book unique is it's a mini animotion book. Each page provides an animotion of the animal as the page turns! It's almost like a mini TV in the book. My girls fought over the book at first as they love the animotion feature, they love zoos and they love baby animals so who can blame them? The book is very appealing because it's small for little hands to hold and turn pages without effort. The illustrations are bright and vibrant and we know kids love that. The words are simple so my kindergartener can read to her sister and that creates a double bonus. It's 12 pages full of delightful fun animals like zebras running, lions pouncing and more. It allows the children to learn a little about what these animals do while enjoying the fun animotion as if they are really moving. I highly recommend this book if you have little ones as it's enjoyable, easy to read and entertaining.